I have been a horse person for most of my life. When my horses retired from riding I was concerned that I might not be a horse person anymore. Happily, this is not the case. I still completely enjoy looking at, thinking about, and being in the company of horses. I know horse anatomy and proportions from my 15+ years of horse keeping, and from my experience creating and animating Pegasus in Disney’s “Hercules”. I have been designing and carving horses for 10 years now, and look forward to finding new ways to interpret their anatomy. 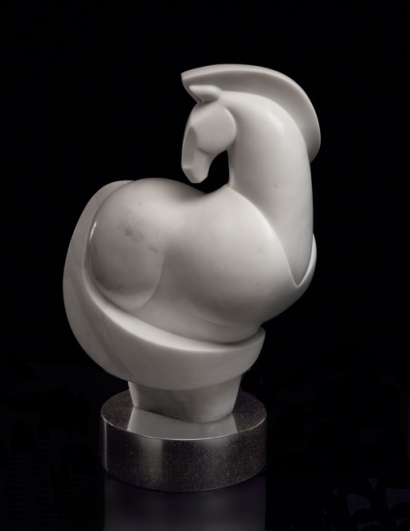 “Pretty-Girl” in the newest stone sculpture in my horse series. The pose is simply standing with a twist, but the design carries the eye in swooping curves throughout the figure. Movement within the held pose is an animation principle that keeps the character alive and dynamic even though there is no actual movement. Swooping lines entice the eye and hold the viewer’s interest for more than a glance. I habitually return to the horse for inspiration and continue to invent new designs—like a jazz interpretation of a beloved standard. I love jazz improvisation, so this makes perfect sense to me. The stone is Carrara Marble, the sculptor’s stone of choice for centuries. It is a dream to carve. The tiny crystal in this marble makes it dependable, precise, and generous in the ease of carving and finishing. The dust is like silk. The veining never disappoints. Only the large vein towards the bottom of the sculpture was visible in the raw stone. More and more vein emerged as I worked up through the grits of sandpaper, finishing at 600-grit. I applied wax for a soft lustrous polish and even more veining appeared. This does not sound exciting in the telling, but in the finishing process it is like magic. I don’t really know what is within the stone when I begin to carve it, and trust that the pattern and vein will be appealing. Geologic serendipity has yet to disappoint me. Pretty-Girl is one of many nicknames for my little old mare, Kentucky. She is about 31 years old now, and no longer resembles the voluptuous mare of this sculpture, but the design could be a caricature of her in her youth. She had quite round proportions with very refined legs and a long tail. She was rescued twice from a meat truck bound for the LA slaughter yards by one of my trainers. I believe she knows she escaped death twice and this explains her enormous passion for life. I bought her from my trainer about 23 years ago and have been her guardian ever since. I think we may be guardians for each other—I ensure her safety and she inspires my art.